Advanced Oxidation Ditches | S&N Airoflo Inc.
Oxidation ditches are very popular wastewater treatment processes for small to medium- sized municipalities that have to meet stringent water quality standards. Oxidation ditches provide cost-effective treatment while requiring relatively simple operational skills. Because carbonaceous BOD removal, nitrification, and de-nitrification can be accomplished within a single reactor, the process can produce a high quality effluent. Obviously, it is important to adequately mix the wastewater with the biomass in the ditch to ensure effective pollutant removal. Mixing is promoted by ensuring that wastewater velocities in the reactor are sufficient to create turbulence which keeps the biomass and solids in the mixed liquor suspended. Generally, average sustained velocities of about 1 fps are considered sufficient for this task. TNRCC also has a requirement of 100 HP/mil gal as a secondary requirement to ensure adequate mixing. Some oxidation ditches have old, poorly performing fixed brush aerators, which provide poor mixing and poor oxygen transfer. One way to solve this problem is to install floating horizontal brush aerators to improve oxygenation and mixing capacities. Operating data from an existing ditch where floating brush aerators have been installed will be presented. Most oxidation ditches are designed to achieve CBOD removal and nitrification. However, many NPDES permits may become more restrictive in the future with respect to the discharge of total nitrogen or total inorganic nitrogen. Therefore, modifying oxidation ditches to include an anoxic zone to achieve de-nitrification is an excellent way to meet the more stringent discharge standards. In this paper, the specifics of enhancing nitrogen removal by establishing an anoxic zone will be discussed. Data from existing oxidation ditches will be reviewed to demonstrate the feasibility of adding the anoxic zone. Another approach for achieving de-nitrification in oxidation ditches is to implement on- off operation of the aeration system. The details, advantages, and disadvantages of on-off operation will be discussed in this paper. Oxidation ditches are biological treatment processes that achieve high performance while at the same time requiring relatively simple operational skills. Older oxidation ditches that have deficient aeration capacity may be easily upgraded by installing floating horizontal brush aerators. Operating data from existing ditches where floating horizontal brush aerators have been used will be discussed in this paper. Oxidation ditches are capable of achieving carbonaceous BOD removal and nitrification simultaneously, and they can achieve CBOD removal, nitrification, and de-nitrification simultaneously by providing an anoxic zone within the reactor. The specifics of optimizing oxidation ditch performance by providing an anoxic zone will also be discussed. In addition, on-off operation of oxidation ditches can be used to enhance performance. Wastewater flowing into the WWTP is typically domestic wastewater although some light commercial and industrial wastewaters are discharged into the Oxford sanitary sewer system. Current hydraulic loading to the facility is about 51% of design capacity with an average daily flow rate in the last few years of about 1.8 mgd. The average daily organic (BOD5) loading is about 1700 lb/day (113 mg/l). Influent ammonia-N levels have been averaging about 270 lb/day (18 mg/l). Consequently, the average daily BOD5 and ammonia-N loads have been about 29% and 46%, respectively, of design capacity in recent years. Beginning in 1997, the fixed rotor aerators began to have mechanical and structural problems. Because of these problems, the units' oxygen transfer efficiency declined. Even though the BOD5 loading to the plant was only about 1700 lb/day (29% of design capacity), the oxidation ditch at times experienced low dissolved oxygen (DO) levels. In addition, poor mixing by the original aerators contributed to significant deposition of biomass at the bottom of the ditch. Occasionally, filamentous bulking occurred, a problem likely caused by low DO levels. As a result, the city's managerial staff decided in 1999 to begin replacing the fixed rotor aerators with S&N AIROFLO floating horizontal brush aerators. In the original system, the fixed rotor brush aerators were designed to provide approximately 88 hp/ mil gal of mixing intensity in the oxidation ditch. At design operation, this level of mixing should be more than adequate to maintain the biomass in suspension throughout the ditch and to satisfy the design oxygen demand for carbonaceous BOD removal and nitrification. However, due to mechanical and structural problems, the original aeration equipment no longer performed at design capacity. Because of decreased oxygenation and mixing capacity, one original 60-hp aerator was replaced by two 15-hp S&N AIROFLO aerators in May, 1999. A second 60-hp fixed rotor aerator was replaced in December, 1999, with two 15-hp S&N aerators. On each occasion, the two new aerators improved oxygen levels and mixing intensity in the oxidation ditch. The three remaining original aerators continued to lose efficiency because of mechanical and structural problems. Declines in oxygen transfer efficiency as well as reduced mixing intensity contributed to poor performance, especially in the summer. Extremely high ambient temperatures (about 100 ；) in August and September, 2000, coupled with reduced O2 transfer efficiency resulted in very low DO concentrations in the oxidation ditch. DO levels were as low as 0.1 mg/l for several consecutive days during this period, leading to inhibition of the nitrifying bacteria in the mixed liquor. Consequently, effluent ammonia-N levels began to approach the average daily limit of 2 mg/l. Under normal operation during summer months, effluent ammonia-N usually is about 0.2 mg/l. Moreover, the mixed liquor was plagued by filamentous bacteria, which contributed to sludge settleability problems. Plant operating staff were genuinely concerned about violations of NPDES effluent limits for ammonia-N, BOD5, and TSS. Again, these problems occurred even though the average daily BOD5 loading was about 30% of design capacity. Because of the deterioration in WWTP performance in August and September, 2000, two more 15-hp S&N aerators were installed in September, 2000, replacing an original 60-hp fixed rotor unit. As with previous S&N aerators, the two new units were installed by using a cable-mounted system. There was no need to cease operation of the oxidation ditch during installation of the new aerators. Furthermore, in-channel modifications were not necessary, which facilitated rapid installation and lower capital cost of the new units. With six 15-hp S&N aerators in the ditch, there was a noticeable change in plant performance. On September 15, 2000, (immediately prior to installation of the fifth and sixth S&N units), DO levels in the aeration basin were about 0.1 mg/l; mixed liquor suspended solids (MLSS) concentration was 1760 mg/l. On September 25, 2000, (a couple of days after installation of the fifth and sixth S&N aerators), DO levels in the mixed liquor approached 2.0 mg/l. In addition, pickup truck sized clumps of biomass began to emerge at the oxidation ditch surface because of increased mixing provided by the new S&N aerators. On September 25, 2000, the MLSS had increased to 5200 mg/l as a result of scouring of biomass from the bottom of the ditch. These substantial changes in oxidation ditch performance were primarily attributable to the new S&N aerators. During the following month (October, 2000), the Oxford WWTP began to perform at an exceptionally high level. Average daily effluent ammonia-N concentrations were 0.15 mg/l, while average daily effluent BOD5 levels were 5 mg/l. These effluent levels represented 89% and 50% reduction in effluent ammonia-N and BOD5, respectively, when compared to the same data for September, 2000. The minimum aeration basin DO level in October, 2000, was 1.5 mg/l. Because of the significant impact of the two new S&N aerators in September, 2000, the City of Oxford began planning to completely convert to S&N aeration as water and sewer budgeting would allow. Two 15-hp S&N aerators were installed in summer, 2001, and the last two S&N units were installed in December, 2001. On each occasion, one of the original 60-hp fixed rotors was replaced. The Oxford WWTP now has ten 15-hp S&N aerators operating in its oxidation ditch. Consequently, 150 hp of S&N aerators replaced 300 hp of fixed rotor aerators. According to the plant's operating staff, the S&N aerators have performed extremely well in terms of oxygenation, mixing, energy savings, and effluent quality. Effluent BOD5, TSS, and ammonia-N concentrations now average 5 mg/l, 4 mg/l, and 0.3 mg/l, respectively. The energy required for aeration has been reduced by at least 50%. At $0.05 per kilowatt-hour, the WWTP is achieving energy savings of about $50,000 per year if all ten S&N aerators are operating. Given that some S&N units can be idled when DO levels are high, the annual energy savings are even greater. Where Total Inorganic Nitrogen (TIN) limits or Total Nitrogen (TN) limits are included in the NPDES permit, the above effluent quality will usually not satisfy effluent requirements. While abandoning the oxidation ditch or substantially renovating the ditch can be done to achieve stringent N limits, more economical approaches may prove successful. One economical approach is to provide an anoxic zone within the existing ditch. This can be done by controlling dissolved oxygen (DO). At mixed liquor temperatures as low as 10C, a design solids retention time (SRT) of 14 days should be adequate to achieve excellent nitrification. Because oxidation ditches are usually operated at solids retention times (SRTs) of 25-30 days, excess volume is available for denitrification. In the anoxic zone, it is important to provide mixing but without aeration. Nitrification will be achieved in the aerobic zone, and denitrification will be achieved in the anoxic zone. During denitrification, facultative heterotrophs will use organic carbon as their electron donor and nitrate-N as their electron acceptor. This can only be achieved at very low DO concentrations. During denitrification, alkalinity is produced at the rate of 3.57 parts alkalinity per part nitrate-N reduced. Consequently, half of the alkalinity consumed during nitrification can be recovered during denitrification. In addition, CBOD removal also occurs in the anoxic zone by the heterotrophic organisms. The denitrification rate will be affected by the type of organic carbon that is available to the biomass. If cell tissue is the primary carbon source (endogenous respiration), the denitrification rate will be relatively low. If raw sewage is the primary carbon source, the denitrification rate will be substantially higher (typically 6 to 10 times higher). The optimum pH for denitrification is 6.5 to 8.0, and the optimum DO concentration is 0.0 mg/l. As DO levels increase from 0.0 to 0.3 mg/l, the denitrification rate goes down. If DO is greater than or equal to 0.3 mg/l, denitrification is completely inhibited. Temperature also affects denitrification; the denitrification rate at 10C is 75% of the rate at 20C. For every gram of nitrate-N that is reduced to nitrogen gas, 2.86 grams of oxygen are saved in terms of CBOD removal. Thus, energy savings of 10 to 20 % can be expected by providing an anoxic zone within the ditch. Denitrification is a zero order reaction with respect to nitrate down to very low nitrate concentrations. Hence, the denitrification rate does not depend on nitrate-N concentrations. DO levels and carbon source are much more important in determining denitrification rates. In an oxidation ditch, mixed liquor flows continuously around a looped reactor. Horizontal brush aerators are typically used to provide mixing and aeration. The oxidation ditch process approaches a completely mixed reactor with relatively short plug flow time. Channel flow rate may be 30 to 40 times the influent flow rate. This results in a high dilution of the influent flow, and BOD and N concentrations. Mixed liquor recirculation time is 5 to 20 minutes depending on channel length and velocity. Ditches are typically two to four times larger than necessary for nitrification, which allows volume for the anoxic zone. Although nitrification rates are greatly reduced at low DO levels, a long SRT allows for complete nitrification. At a DO concentration of 0.1 mg/l, nitrification is about 16% of its maximum rate. Through design and operation, it is possible to create anoxic and aerobic zones to achieve nitrification and denitrification. Mixers are needed in the anoxic zone to keep the biomass from settling. The location and size of the anoxic zone will change as flow rates and wastewater strength change. 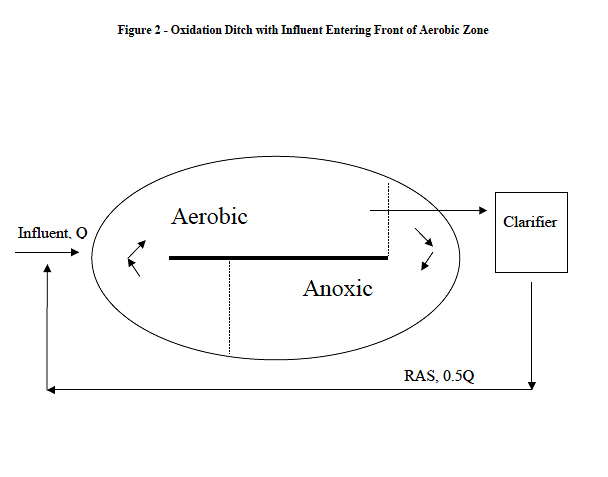 DO control is needed to provide the anoxic zone within oxidation ditches. As the mixed liquor flows down the oxidation ditch channel away from the aeration zone, DO is depleted. The mixed liquor then travels through an anoxic zone before returning to the aerobic zone downstream of the aerator. The size of the anoxic zone affects the degree of nitrate reduction and overall nitrogen removal efficiency. With DO control and the ability to vary DO levels in the aeration zone, an aerobic zone for nitrification and anoxic zone for denitrification can be maintained to enhance nitrogen removal. However, the DO concentration depends on plant operating skill and attention, and may also be limited by the operating range of the aeration equipment. In some cases, complete nitrification and almost complete denitrification can be achieved. Although the nitrification rate is significantly reduced at low DO levels, a long hydraulic residence time (HRT) and long SRT allows for complete nitrification. If possible, it is better to bring the influent to the head of the anoxic zone (Figure 1) so that some of the wastewater carbon source is used as the electron donor to drive the denitrification reaction. Effluent from the ditch is taken just upstream of the anoxic zone and sent to the final clarifier for biomass settling. If the ditch is very underloaded, it may be necessary to turn off the aerators periodically to reduce DO levels; otherwise, too much DO is carried into the anoxic zone. 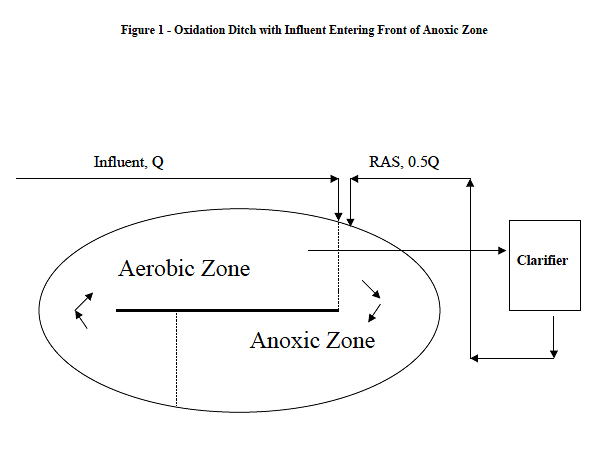 In some oxidation ditches, wastewater influent enters the front end of the aerobic zone (Figure 2). The length of the aerobic zone depends on the DO concentration in the aerobic zone, channel velocity, and the oxygen uptake rate (OUR) of the mixed liquor. By the time the mixed liquor reaches the front end of the anoxic zone, most of the raw wastewater organics have been oxidized. Consequently, unless another carbon source is provided, denitrification proceeds according to endogenous respiration, which results in a very low denitrification rate. It should be noted that plants A, B, and D have filtration following the final clarifier. These data clearly indicate that oxidation ditches with an anoxic zone can achieve remarkably good effluent quality. On-off operation of the aerators in an oxidation ditch is another economical approach that may be used to enhance performance. It is desirable to provide mixers in the ditch to keep the biomass suspended when the aerators are off. However, it may be possible to achieve denitrification even without mixing during the aeration-off period. Use of an Oxidation-Reduction Potential (ORP) meter is also desirable to improve process control. At selected times the aerators are turned off and the mixers are turned on to maintain channel flow and biomass suspension. During the off period, the oxidation ditch becomes an anoxic reactor, and nitrate is converted to nitrogen gas. The ORP probe measurements in the ditch provide the control system information to determine when to terminate the off cycle and start aeration. The desired off cycle is one that depletes all the nitrate in the ditch mixed liquor but does not continue without aeration past that point. In this case, BOD removal is not inhibited by the lack of an electron acceptor, and the time available for nitrification is maximized. The ORP process control method is based on the change in ORP readings as oxygen and nitrate are depleted by the microorganisms (Figure 3). 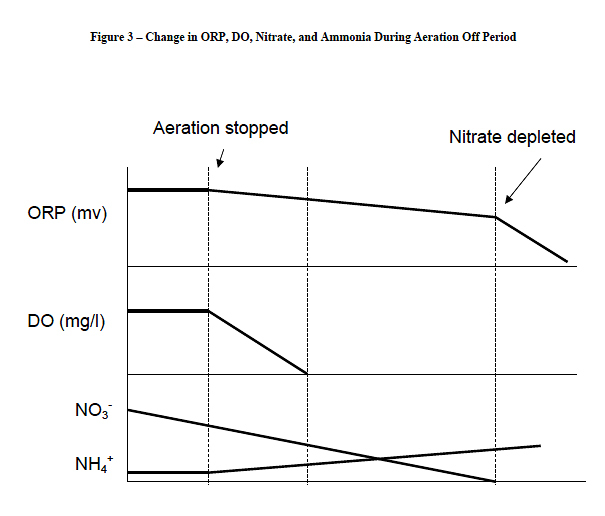 During nitrate depletion a gradual drop in ORP occurs. When the nitrate is fully depleted, the ORP reading drops substantially as more reduced conditions are developed in the mixed liquor. When the large increase in slope is observed (indicating full nitrate depletion), the aerators should be turned on and the mixers should be turned off. When the aerators are off, the DO level drops and nitrate reduction occurs. Nitrate reduction should occur in the ORP range of +50 to -50 mV. When the ORP drops below about -50 mV (nitrate fully depleted), anaerobic metabolism will begin. During the off period, the ammonia-N concentration increases. Since the ammonia-N increases during the off period, a higher DO uptake will occur initially when the aerators are turned back on. During the aeration-on period, the ORP reading should stabilize in the range of +50 to +325 mV. With on-off operation, the nitrogen removal performance is determined by the oxidation ditch HRT, the influent flow rate, TKN and BOD levels, the number of on-off cycles per day, and the ditch MLSS concentration. Longer HRTs provide greater dilution of influent ammonia-N levels during the off period and result in lower effluent ammonia-N and nitrate-N levels. Two on-off cycles per day can produce effluent Total Inorganic N (TIN) levels of less than 10 mg/l. Increasing the number of on-off cycles to three or four per day will provide only marginal improvement in nitrogen removal efficiency. High influent flow rates and high influent ammonia-N levels during the off cycle will adversely affect performance and result in lower nitrogen removal efficiency. If the operators decide not to use ORP probes to monitor performance, on-off operation can still be used. A trial-and-error approach can be used to determine the optimum number and length of the on-off cycles. An initial approach might be to turn the aerators off from 1:00 pm to 5:00 pm and 1:00 am to 6:30 am each day. Another approach might be to begin with three on-off cycles per day. If the plant is highly loaded (BOD load is > 75% of design BOD load), the on period could be 5-6 hours and the off period could be 2-3 hours. If the plant is significantly underloaded (BOD load is < 50% of design BOD load), the on period could be 3 hours and the off period could be 5 hours. Using a trial- and-error approach, the on-off cycles can be tailored to the specific conditions of the particular oxidation ditch. Stensel, H. David and Thomas E. Coleman, (2000) Technology Assessments: Nitrogen Removal Using Oxidation Ditches, pp. 2-1 to 2-6. Metcalf & Eddy, Inc., (2003) Wastewater Engineering: Treatment and Reuse, Fourth Edition, pp. 776-778. WEF Manual of Practice Number 8, (1992) Design of Municipal Wastewater Treatment Plants , Volume 2, pp. 927-928. WEF Manual of Practice Number 11, (1996) Operation of Municipal Wastewater Treatment Plants, Volume 2, pp. 771-779.